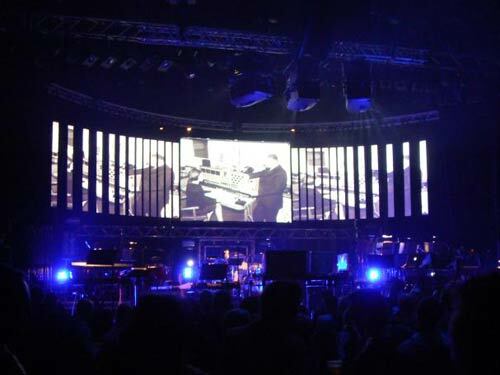 On May 17th I went to see an evening with 'The Radiophonic Workshop' at Camden's Roundhouse, which was part of their Short Circuit festival of electronica. Yesterday I posted my review of the gig. Before the show started there was an hour long Q&A session with 5 members of the Radiophonic Workshop, which I was lucky enough to attend. Here are some of my notes from the event. Thanks to their involvement with Doctor Who, many of the anecdotes had the air of being well rehearsed over years on the conference circuit. But I'd never seen any of them talking before, so everything was fresh for me. They started off by explaining a bit about how the evening was going to be different from how we had ever experienced the music before. Firstly it was going to be in surround sound. And secondly - we'd actually be able to hear the bass. It was pointed out that when they were recording for TV shows in the sixties and seventies, the bass speakers were tiny. Nowadays, you can get television sound systems big enough to live in. 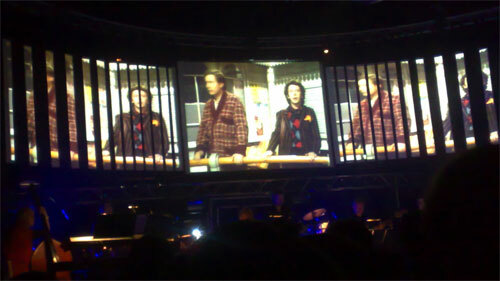 The Radiophonic Workshop is considered to be very influential within the UK experimental music scene. One question from the audience during the evening was what were the panel's influences. Composers like Sibelius and Shostakovich featured, as did The Shadows - apparently they were very good for studying the rules of harmonic progression. Interestingly though, Peter Howell did suggest that it didn't take long working within the BBC to get quite insular in what you listened to. During the concert itself, one of them remarked that since their music had accompanied so much educational programming through the years, they were inadvertently responsible for the nation's "dreadful literacy". One of the aspects of their work they discussed was the terror of working to a transmission deadline. Roger Limb described the sensation that gripped him when he picked up a copy of Radio Times on a Thursday, and in amongst the listings for the next 7 days would be credits like "Incidental Music by Roger Limb", for programmes he hadn't even started thinking about the composition for. Likewise Peter Howell described how during a long running series you gradually ended up getting further and further behind in the filming and editing schedule. This drastically reduced the amount of time available to compose. When working on "The Body In Question", for example, by episode 8 a malaise had descended on the production team as they got just over halfway, but still had a lot of episodes to produce. It didn't help, he said, that the focus of the final episode was firmly on 'death'. Paddy Kingsland related the tale of producing Hitch-Hikers for the radio. Having expected the programme to run one episode a week, at the last minute it was switched to running every day for a week. That somewhat compressed the schedule for producing the audio, and the tape for the final episode only reached Broadcasting House with minutes to spare before it was due to air. The team described the excitement in the office when the first Fairlight arrived. As well as shaping the sound of popular music for a good few years, the Fairlight also liberated the workshop from complex tape-cutting. On the day they unboxed it, they spent so long in a tiny room trying it out, that eventually they were interrupted by their secretary apologising, but saying she really had to go home. They'd basically spent 5 hours playing tunes in dog barks. 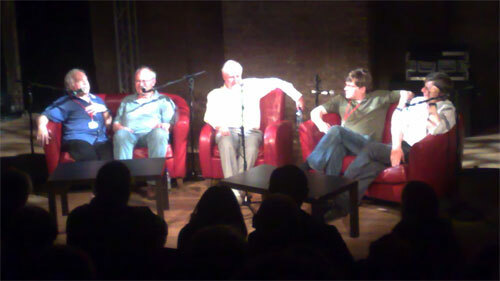 The panel were keen to stress that it wasn't all electronics at the Radiophonic Workshop. Maida Vale studios was also home to BBC orchestras, and session musicians of all types. That meant that securing a trumpet solo could be as easy as bumping into the right person in the queue at the BBC canteen. And sometimes - as was once the case with some timpani - recording things in the corridor as they were moved between studios. Mark Ayres also stressed that the workshop always produced 'applied music'. This wasn't experimentation for the sake of it, or three months spent in the studio making a masterpiece, this was a production line for producing material for broadcast. Or experimentation at the expense of some hapless programme producer as it was also described. I'm really glad that I went to the Q&A session - it really put the gig into context. I'd been expecting it to mostly dwell on sci-fi, but the Q&A made me realise what a wide range of programmes they had worked across. Without me noticing it at the time, the 5 guys in front of me had provided by far the vast majority of the soundtrack to what I watched on telly when I was growing up. 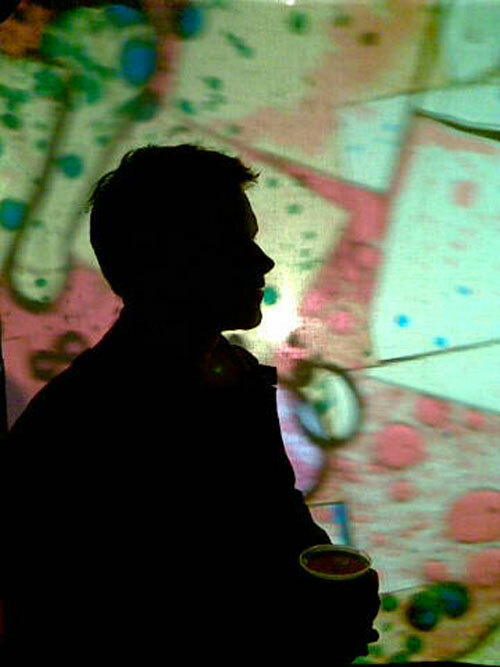 By Martin Belam on 31 May 2009. That's a very groovy picture of you at the bottom of the article. Which talented individual was responsible for it? I would have loved to have seen this! 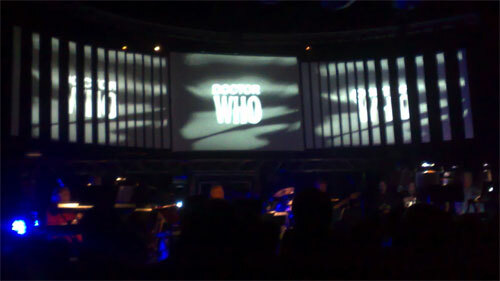 The Radiophonic Workshop is my childhood. I wonder if there is an audio or video recording of it available? I wonder if someone recorded a feed from the soundboard? To be honest David, I assumed there would be a DVD/Live CD release following the gig, but it doesn't seem so. You can watch the video montage for Ziwzih Ziwzih OO-OO-OOon YouTube though.